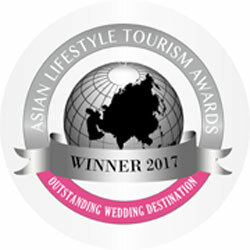 (Nusa Dua, October 2017) Samabe Bali Suites & Villas is delighted to announce that has recently won the Outstanding Wedding Destination awards at the Asian Lifestyle Tourism Awards 2017. This award recognizes outstanding hotels in the hospitality industry. After few years of operation, Samabe Bali Suites & Villas has quickly established itself as a leading resort in the region and globally with a unique blend of inspiring architecture adorned with traditional Balinese hospitality. “Wedding is one of the most unforgettable events in people’s live and by its concept we would take part of people’s happiness by provides choices of wedding venues which completed with luxury accommodation, 5-star standard service and facility and experienced Chefs and his culinary team whose ready to cater your celebration. Received this recognition from Asian Lifestyle Awards as the Outstanding Wedding Destination 2017 is indeed become a good start for many big weddings to host in the future”, Said Ralf Luthe, General Manager Samabe Bali Suites & Villas. Chosen as wedding destination by local and international couples and been featured either on local or international media, Samabe Bali Suites & Villas is the perfect setting for intimate nuptials and honeymoons. From private ceremonies by the beach to the romantic yet luxury ceremony at the Pearl Chapel overlooking to the Indian Ocean, the resort will offer guest truly unique wedding and loving memories that will last for a lifetime. Asia Lifestyle Tourism Awards is reflect, promotes and develop the tourism destination by providing all luxury hotel and resorts with recognition for their excellent facilities and services. This awards is being organized with inclusion of more than 1000 distinguished Lifestyle Tourism destination in Asian region.